Football fans are flocking to stadiums around the country to not only cheer for their favorite teams, but also to pre-game party in the parking lot. Beyond the boisterous spirits associated with game day, many new cars today feature amazing technology that can take tailgating to the next level. Autotrader editors recently published Tailgating Tech: 8 Cool Must-Haves for Fall, which highlights new products that lend an extra edge to tailgating. The 2017 Honda Ridgeline is an audiophile’s dream come true. This pickup boasts a fierce in-bed audio system made up of six 10-watt waterproof exciters (think speakers on steroids) built into the bed walls. Now, game-goers can soak up the scores and the tunes on the outside — no more rolling down the windows to hear the tunes. Need room for a few more bros on the road? The flip-back, third-row seat on a used Dodge Grand Caravan is perfect for parties. In addition to sweet grub, tailgaters need access to scores and social media updates on how teams are faring. Chevy and GMC drivers will love the in-car, 4G LTE Wi-Fi, which provides seamless Internet access on the go. You can’t think of tailgating without thinking about the Ford F-150. It boasts a roomy, LED-lit bed for storage, numerous electrical outlets, and heated and cooled massage seats to add extra comfort pre- or post-game. Ah, sweet, sweet storage. It’s there for us when we need just a little more room to tote extra bags of chips and buckets of potato salad. 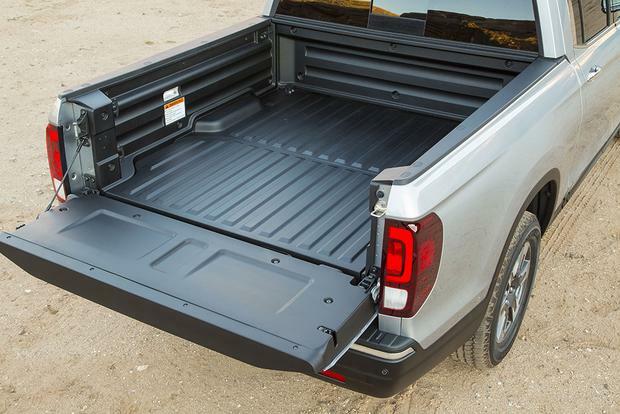 In the 2016 RAM 1500 pickup, the RamBox is your new bestie. No game-day bash is complete without some cold ones and a YETI cooler. Even better? Showing your college spirit with an officially licensed YETI cooler boasting the name of your alma mater. Sweet speakers, plus a powerful car-battery starter? Done and done, thanks to Dreamwave Survivor, a high-performance 30-watt Bluetooth sound system combined with a 400-amp emergency 12-volt car-battery jump starter. You can fire up your favorite game day playlist all tailgate long using its built-in 12,000-milliamp-hour lithium-polymer battery. Tailgate grills are like a favorite team t-shirt or a well-worn ball cap – you can’t really imagine a tailgate party without it. The Party King Grills SWING’N Smoke Varsity 6412 is just the thing to get your burgers and dogs done right. For more information about Autotrader’s Tailgating Tech: 8 Cool Must-Haves for Fall, visit http://www.autotrader.com/best-cars/tailgating-tech-8-cool-must-haves-for-this-fall-256214. Autotrader is the most visited third-party car shopping site, with the most engaged audience of in-market shoppers. As the foremost authority on automotive consumer insights and expert in online and mobile marketing, Autotrader makes the car shopping experience easy and fun for today’s empowered consumer looking to find or sell the perfect new, used or Certified Pre-Owned car. Using technology, shopper insights and local market guidance, Autotrader’s comprehensive marketing solutions guide dealers to personalized digital marketing strategies that grow brand, drive traffic and connect the online and in-store shopping experience. Autotrader is a Cox Automotive™ brand. Cox Automotive is a subsidiary of Cox Enterprises. For more information, please visit http://press.autotrader.com. Cox Automotive Inc. is transforming the way the world buys, sells and owns cars with industry-leading digital marketing, software, financial, wholesale and e-commerce solutions for consumers, dealers, manufacturers and the overall automotive ecosystem worldwide. Committed to open choice and dedicated to strong partnerships, the Cox Automotive family includes Autotrader®, Dealer.com®, Dealertrack®, Kelley Blue Book®, Manheim®, NextGear Capital®, vAuto®, Xtime® and a host of other brands. The global company has 33,000 team members in more than 200 locations and is partner to more than 40,000 auto dealers, as well as most major automobile manufacturers, while engaging U.S. consumer car buyers with the most recognized media brands in the industry. Cox Automotive is a subsidiary of Cox Enterprises Inc., an Atlanta-based company with revenues of $18 billion and approximately 60,000 employees. Cox Enterprises’ other major operating subsidiaries include Cox Communications and Cox Media Group. For more information about Cox Automotive, visit www.coxautoinc.com. For media inquiries, please visit the Autotrader Media Room. To visit the Autotrader Media Room, click here.